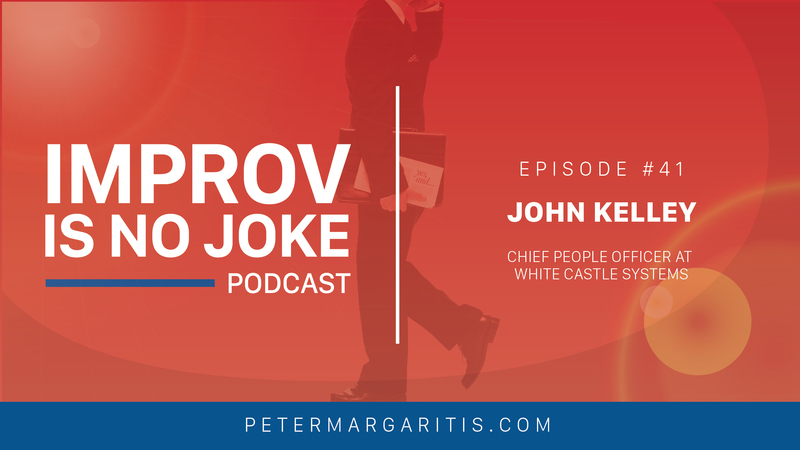 Today we’re excited to have returning guest John Kelley, Chief People Officer at White Castle Systems. We discuss how the skills of improvisation relate to change management, and how being a family business affects their company culture. Change management is the process of identifying and implementing necessary changes during a major business transition, whether that is a merger, a shift in culture, or a new building. White Castle Systems moved into their headquarters in Columbus, Ohio, in 1934. Currently, it houses four or more generations of family and team members, from the Baby Boomers to the youngest generation of workers. They need a bigger space, and a space that better aligns with White Castle’s mission, vision, and core values moving into the future. They’re building a new headquarters that the company can use for another 80 plus years, and that requires a great deal of change management. How are the work spaces designed for both collaboration and to allow privacy? How can they make the space a place where people want to work, while offering the freedom to work anywhere? How can they make shared spaces that people want to go to? How do they keep things both open and secure? To answer these questions, John is practicing one of the key pieces, and often most difficult pieces, of improvisation: listening. They are listening to consultants, touring the buildings of other companies in the industry, and conducting in-depth one-on-one interviews with their team. John won’t be able to please everyone. However, by focusing on the company’s mission, vision, and core values – and asking why every decision they make is in line with those three things – they will be set up for success during the transition. Peter: Hey everybody. I’m with John Kelly today, who is the Chief People Officer for one of my favorite companies in the whole US of A: White Castle Systems Incorporated. John, thank you for taking time to spend with me as a guest on my podcast today. John: Sure, thank you, and thanks for the invitation. Peter: I’ve been so looking forward to this. I always enjoy our conversations and, just so the audience knows, prior to starting this we’ve already had a 35 minutes conversation. The conversation we’re going to have today is going to be somewhere around the lines of change management, and different aspects of that. But before we get into the conversation, John… Oh, as a side note, most of my audience, if they know me, they know that I’m a connoisseur of the Kentucky brown water AKA bourbon. And I pride myself on my my Makers Mark bottle collection and my bourbon collection. Well, I’ve met the person who has blown my doors off, as it relates to the collection of bourbon. This man has more unique bottles of bourbon in his cabinet and his house than I could ever imagine. If I brought a few of my friends up here from Kentucky they would be in [heavenly sound]. So John, give us a little bit about your background. John: Yeah, thanks. Thanks for the acknowledging the collection. You were the one that basically turned me onto it. Peter: Oh, well, you’re welcome. John: Yeah. So, real quick, I was an elementary teacher for about a year-and-a-half before I started working at White Castle. They lured me into something we were trying at the time, which was international franchising. So we did try, and we don’t franchise in the United States but we have tried internationally, and when I started we had stores in korea. During my time in international we opened up Mexico. Everything’s closed outside of the united states now, but we were trying it back in the nineties. At some point, then, I moved on. It gave me an opportunity to learn everything, a lot of different things about the company, especially operations. And I jumped into HR and training. With my education background, I think several people thought “what better?” And we had not had a centralized training function, so we’re kind of building everything from scratch even though we were into our 75th anniversary. So, slowly over that time, since the mid-1990s, I’m part of the family. So my great-grandfather started the company, I started with the company reporting my cousin, who’s our CEO and president. I have a brother-in-law who works here, two sisters, some other cousins. All of us have a great time working together and we are a family-owned company, so it’s been really interesting reporting to my cousin. John: Because sometimes we see eye to eye on things, and sometimes we don’t. We have good conversations behind-closed-doors, but we we always present a united front and have really have been working to try and, I would say, give some new meaning to some of our values. We obviously have a very strong culture. We’ve got a very low turnover in our restaurants. We’ve got about 10,000 total people in the system, and we’re right around 100 percent turnover, which is low for the industry when we look at everything in the restaurants. In the home office, we’ve got exceptionally low turnover. We’re just trying to give new meaning to some of our values and guiding principle. They haven’t changed a lot, but just to give some new meaning to them. It will be our hundredth anniversary in 2021. Peter: That’s cool. So, side note, it is a family-owned business. It’s been around since 1921. But working in a family-owned business, just in itself, presents a lot of different challenges than it would in a publicly-held or privately-held business that’s not family-owned. John: You know, it does. On one hand I would say, like a lot of things, it’s kind of a double-edged sword. I know there’s people out there who have my back, I know that I can have a conversation with them, but sometimes you have to have difficult conversations with a family member and then realize… you know, we’re all gonna be at our family meeting in June, and everybody’s gonna be there. Or we have a cousin’s lunch that’s coming up. So if we don’t see eye-to-eye on something, you can’t take it personally and we really spent a lot of time trying to divide, and as a family, really work to make sure that the family survives, despite whatever happens in the company. Our identity is as a family that owns up that owns a business. So we don’t make business decisions based on family, but we want to make sure that we’re a family first. Peter: That’s great, because a lot of family businesses start out with all the great intentions but stuff gets in the way, or they get themselves in the way, and feelings get hurt. And the next thing you know, somebody’s buying out somebody else or the business is absolutely dissolved because the family can’t get along. John: Right. We’re in fourth generation. The other three generations transition pretty well. We just went through a transition from my uncle, Lisa’s father, to Lisa. Our generation have been working on that for about 10 years, where I’m the oldest of my branch, Lisa’s the oldest of her branch, and there’s another guy named Dave who’s the oldest of his branch of the family. And we had all, at one point, expressed interest that we might like to be considered to be President and CEO, when the time came. And then we worked with a family business advisor to, first, come up with a process that we would go through, and then present a united front to the rest of the family, to the board, to everybody else to make sure. And it was, again, around keeping the family together. John: We moved here in Columbus in 1934. We’ve been in a building that has been modified. You can you can walk in the building and see which era the construction was done on the second floor, whether it’s nice mahogany paneling up front or seventies paneling in the middle or wallpaper in the back. So we have done a lot, we’ve got one woman who sits in an old vault where the door has been disabled. We’re just trying to squeeze people in about anywhere, and we’re all excited about trying to build a new building, but with that comes, as you were talking about, change management. We don’t have any Silent Generation, but we’ve got a significant number of boomers, gen-x, some Millennials, maybe just starting even some of the younger Millennials and Gen Z and stuff. We’re looking at building a building that is gonna last for another 50 years 60 years, we’d like, and I’m really trying to figure out what kind of environment that’s going to be because everybody kind of has a different version of what would be best for them, and how we want our values of accountability and customer focus and responsiveness and healthy and energetic to come alive in that. Lisa and I really feel that our re-defining of some of our values moving into this building… we’ve got a lot of riding on how much this is going to help us advance the culture that we want to shift to, from a dynamic standpoint. Peter: So I do want to touch of that, but I also want to say that when I’m out and about talking to people I always talk about this friend of mine who’s the Chief People Officer at White Castle, and the response I get, a vast majority of the time, is I love his title. Chief People Officer, vs Vice President of Human Resources, and some of us who remember the Saturday Night Live Gilda Radner… did you say human race horses? Peter: Because it is the business that you’re in: you’re in the people business. Without people, White Castle doesn’t exist. Customers don’t exist; we don’t have them. And I love the fact that you’re the Chief People Officer because you’re trying to manage a mass amount of people within your organization and guide them in a direction that the company’s going, and as you’re talking about building this new building, and you said we’ve got maybe three to four generations who will be in this. Everybody’s usually trying to figure out how it fits for them, but should that conversation actually be what’s best not for me, but what’s best for the company and the culture as we move forward? John: Definitely. We’ve been studying a lot of other buildings. We actually just got back from a tour of a couple other headquarters in the industry, and I learned a lot from them because they did talk about what’s best for the culture that we want and what’s best for the the brand as a whole. It’s interesting that you bring that up, because I specifically chose that title when I was promoted to this level. We don’t have HR, per se. We call our HR department team member services, and I chose that title as well because, collectively, our mission is to create memorable moments for our customers every day. We talk a lot in our home office about the customers being team members. So we’re trying to work to create memorable moments and make sure they’re they’re happy, and they can only give service and create great memorable moments to the level that they have experienced it themselves. So there is a little bit of a tension there, but I think it’s a good tension of looking at every team member in our home office as a customer, and what do they really want, and then also be able to define here’s what may not be exactly what you think you want, but this is what we know you will want at some point. Because it is it is bigger. As somebody who’s only got 10 more years out of that 50, or less, there’s going to be other people here, ideally, who are here for another 30 or 40 years out of that time frame. We’re also building it, obviously, to be a lot more flexible than this thing we moved into over 80 years ago, which was an old tire plant before we had it. John: Yeah, my grandfather talked about his first job here was scraping rubber off of the windows because it was so so nasty. Peter: Oh wow! [laughs] My first introduction to white castle systems, that just reminded me, was many years ago on the fourth of July. I was sitting in the parking lot watching the fireworks in downtown Columbus, because it was a great vantage point at that point in time. I was like, where we going? “White Castle” With all the the great little sliders? “Yeah, this is their headquarters.” Oh, it’s here in Columbus? I was like a wide eyed, bushy tailed kid that I was on the, in my mind, the hallowed grounds of white castle. But thinking about these past 90 plus years, going into a hundred and you’re moving into a new building and being Chief People Officer, you don’t have any gray hair… so. John: Oh, I do. It doesn’t show as much when I get a cut, but my sister’s make reference to it quite frequently. Peter: [laughs] But I imagine there’s a number of challenges that you’ve got to deal with. Even the way the new building is going to be designed versus the traditional way that you’re currently in today. John: Right. Whether it’s the new building, and because we’re in an old building that is not flexible and somebody probably knows which are the load-bearing walls and other things, but there are a lot of hallways and a lot of doors and a lot of offices. Obviously, that does not make for a lot of collaboration, a lot of project team work. We’re trying to move more towards that, as a lot of companies are doing it very successfully, but I know the the newer team members that were hiring, the millennials, that’s how they got through school. That’s what the expectation was: I’m not going to be working on just this kind of thing; I’m gonna be working cross-functionally with people from marketing and purchasing and coming up with new products and contributing in a in a much bigger way than even I was when I started. So yeah, it’s trying to find that balance of what’s what’s going to be comfortable and what’s also going to be usable, and foster that collaboration. I recognized years ago, when I was trying to get people to sign up for some charity event, that, in our old building, we have no one place where we could hang something where everybody will see it. There’s multiple ways in and out of the building and other things that… it’s just we can’t communicate with everybody and know that if I hang a sign here in the lobby everybody’s gonna see it. Same kind of thing with our with our overall cultural shifts, because we had gotten to the point where team members were very comfortable. We always talk about our family atmosphere, the way we would call of our team members our family. We want to be one big family and a family culture, and in a family culture everybody looks out for everybody else. What does that mean? There were some expectations that if I had something now I would always have it into the future, and now as things change one of our big ones that we have recently been talking about is, up until january first of 2017, we had a an open, unfrozen a pension plan. We just froze that pension plan. We’ve been talking about it for a couple years and we had a pension plan a profit-sharing plan. Last year we opened up a 401k, but we we just started getting 401k because we’ve been trying to nurse this pension, and it’s getting so incredibly difficult. That, in and of itself, is another huge cultural shift of… you know, company taking care of you. You have some personal responsibility and the company will participate in that, but it was an exceptionally difficult decision to make for us. But it’s just an old plan, an old style. Peter: Exactly. On one side, it kind of surprises me that you you guys just now are getting rid of the pension plan and moving to a contribution plan to 401k. But you’re a family owned business, you have team members, you have very low turnover… so you have a lot of people highly invested into this pension plan. Yeah, that is a real cultural shift of the company taking care of you versus we’re going to help contribute, but you’re more accountable for your managing your retirement. And I’ll just say, the a lot of people who are not CPAs and not accountants… numbers they’re afraid of. Peter: A lot of times there’s fear, but it’s also a lack of understanding, but it’s also “I don’t want to ask a question because I don’t want to sound like I’m stupid,” but really the message is you’re not. You just need to ask more questions. Peter: And have somebody there to say that this is how it works and let me let me teach this to you versus I can’t believe you don’t know this. John: What I’ve encountered, being the leader of benefits, I love it when I go out because I’ve talked to many financial planners of our team members here, locally, who have gone out and and worked. They say “so you know Vicki in benefits?” And I say oh yeah, she is awesome about answering all the questions. She’s defined-benefit expert. And it really is. We desperately want everybody to understand it and trying to do a lot of things that people do. It was interesting. There was an interesting piece to this in how many thank yous I got when we talked about opening up the 401k. Because some of the younger people hadn’t looked at it, they really thought I’m missing out because everybody else in my circle of friends or family are saving for their retirement, and I don’t have this thing that called a 401k. But they didn’t understand, really, what the pension was, which was the companies are going to give you money when you retire. But it also is it also falls under that… “well gosh, I’m 22. I’m not retiring until I’m in my sixties. I don’t need to understand all those things. I got the the more normal day-to-day stuff.” To add to that that, our two largest facilities, where the biggest groups of people are, are our home office (with with about 200 people) and our largest food processing plant, which makes our grocery store sliders. Our largest one of those has 200. Otherwise, they’re dispersed in little castles with 20 to 40 people in them, depending on the sales. So 10,000 people dispersed over 400 locations… it just adds a level of communication challenges. Peter: How many states are you in? John: I think around 14. Peter: But you’re more concentrated in and the Great Lakes region. John: Yes. Our largest single region is Chicago, with 80. New York and New Jersey together have about 75, I think, and then we’re in Michigan, Ohio, Kentucky, Indiana, Illinois, Missouri, Minnesota. Peter: Because I always wanted you guys to put one in Tennessee, Georgia, northern part of Florida, Central Florida, and Fort Myers down 75 so that, when I used to drive to visit my family in Fort Myers, I would have my stopping points. Because when I go to Lexington to visit friends, I always stop at the White Castle (especially coming back) that’s a just north of King’s Island in Lebanon. That’s my stopping point to grab about three jalapeno burgers and get back on the road. John: We do have some in Tennessee. We looked farther south… I think, at some point, you’ll see something a little farther south, but we’re probably going to skip a lot of some of those states. A lot of people ask us, actually… there’s rumors about a gentleman’s agreement with Crystal. The company is very similar to us, copied us. They started about 10 or 12 years after we did. There is no gentleman’s agreement. Actually, Nashville, Tennessee and Lexington are the two places where we both have restaurants and compete, and it’s one of the fun things, if you’re ever bored, is to watch when a particular piece maybe goes viral on twitter or facebook or anything. The people who started out with White Castle are generally a loyal White Castle. If you grew up in the South, you’re gonna try and defend your your crystals a little more. But we love that are our cravers jump right on and and love us as much as they do. Peter: Well, being a guy from the South who was introduced to Crystal… I was all in crystal and then I met the slider family, and I’m all in the castle these days. I haven’t had a crystal burger in 30-plus years, I think. Peter: The thing about this this culture and how you’ve grown and how you’ve maintained and the challenges that you have and your opening this new office, and you’re telling me that in this new office it’s going to be more of an open, collaborative type of office. Peter: Versus there’s no collaboration, per se, or the ability to collaborate. So that’s gonna bring its own challenges, in itself. John: We’re still in the early design stages and trying to figure out how things are going to work in the new building, but we’ve been talking to team members about what what are they used to working with, what they like about their workspaces, and what do they not like about their workspaces. I think we had 98 percent of our team members fill out that survey, so we got a lot of really rich data around that. The pieces they like about the the office, their feelings about it and brand and all kinds of things. We had interviews with him, as well, where we were able to start… and I would say, because I sat in on about half of them and one of my colleagues sat in on the other half, and it was more of a qualitative part of a research project and trying to figure out…. okay, so tell me, you talk about really needing your doors. How do you use your office that you really need your doors? “Well I need it to be closed when I really need to do some heads down work and can’t be disturbed and I don’t want people coming up in this open environment,” and most of them had never really seen anything like this because most of the career has been here. John: They they see pictures of, you know, Facebook, where there’s three people on a table the size I’m sitting at and everybody’s like all crunched together, and so we’ve been able to start talking about it. Imagine that your space might not be exactly where it is, but if there’s this quiet section and part of our culture becomes, when you see somebody in that room or in this area, it’s quiet and you’re not supposed to have your conversations there. Don’t go up and tap somebody on the shoulder because, whether it’s orange carpet or somehow divided, you’re there. Some of them are starting to come around. Peter: Your current office, as you were describing it, and I’m trying to think what’s the one point in that office where you could collaborate amongst many, outside of a meeting room or conference room, is your cafeteria. Peter: And it just dawned on me: so as you move to a new building, from what I understand, the the first floor will actually be a White Castle restaurant, is that correct? John: The first floor will be our cafeteria and it will serve a lot more of our products. We serve a lot of our products now in our cafeteria, but our cafeteria is in the basement. There’s no light and people don’t like going down there. John: And I think one of our guiding principles, and this was confirmed for me on my recent trip, is that with technology… you know this because you travel so much: you can get a lot of work done and you don’t have to be in your office. You have your office with you wherever you go, with your phone your laptop. What a lot of companies are trying to do, including us, is people can do their work anywhere they want. They can work from home and work from other places… But create an environment where people want to come because there’s cool amenities, I know I’m going to see my friends there, I know I’m gonna have those spontaneous interactions, I know I’m gonna have those times where I can have a cool place to work that is even cooler than my dining room table or my office at home, and things like that. Peter: So the first floor will be the cafeteria, but will it be open for retail customers or is it just going to be for White Castle employees only? John: We are working through that. I would like to see it open for our retail customers as well. Now, figuring out security… that’s another interesting thing because we saw two drastically different versions of security on this trip with these two atlanta-based companies. Right now, as you know, when you come in to visit there’s kind of a room that you’re standing in and you can’t get out of that room until somebody comes to get you. In this new environment, we might have those little glass doors… or there’s a person sitting at a desk, but just anybody with any amount of strength could get over those things very easily and run. So there’s cultural change management things on almost every level. People are starting to realize that and so “Well, how am I gonna be protected?” Although there’s a lot to be protected from around here, there’s condo’s across the street, but there’s change management at every level. But I would like to see that: our cafeteria open to others as well. Peter: Because I love coming down to visit you guys and eating in the cafeteria. Yes, it’s dark, but it still serves great product. [laughs] Security… so I don’t know this, when employees come to work at White Castle, currently, do you have to wear badges? John: Yes we do. Your badge opens up the doors. John: I’m sitting, right now, in our training center, which is actually a detached building and it’s got its own badges as well. So we will still have some version of that, because the badges also, ideally, at some point they’re going to turn into here’s how I can buy a coke out of a vending machine here’s how I can pay for my charges in our mail room or in our cafeteria. It’s also how, using common printers, people can print their papers. Talk about a cultural change for a 95-year-old company to go we’re not trying to go completely paperless, but we’re trying to move that digital way, and even my HR department’s like “we gotta have that paper.” Well, we don’t have to have as much of it. Peter: I don’t think there’s such a thing as a paperless office anymore, but I think we’ve moved to officers that consume less paper. John: Yes. Actually, we did an early thing with CBRE, and they were from all over, but they they have one office, which, apparently, and I still can’t figure out how to do from IRS things and tax forms and stuff, but they say they are 100 percent paperless. They have no printers in that building. Peter: Whaaaaaaat? That’s Jetson-y, man. John: Yeah, it is. I’m not sure how they do it, but one of my personal things I’m trying to figure out is if there is a way… I still take paper-based notes in meetings and other things. I have tried to take them on my personal laptops or other things. Even with Evernote and some of those things, when they get in there it just never comes back out. And you know… sometimes I miss things or something. So I went back to paper and Lisa, my cousin, has done a very good job of of going much more paper-less. She does not take paper notes. She takes notes on an iPad or computer. Peter: I think early on in my speaking career, when we were using more paperless stuff and people in the audience were using more tablets and on their phones and stuff… I thought in my head that they’re multitasking. But it’s it’s not wrong, it’s just different. John: Yes. I serve on on a not-for-profit board where somebody wanted to say… it was this juxtaposition. So the board packet that would come to all of us. It would come to us electronically a little bit ahead of time, and then somebody was saying well should I print it out there? And then finally somebody said well why can’t some of us… I do mine electronically, so I’m sitting with an iPad? Somebody said exactly that. “Are you reading your email? I think everybody should put all of their electronics away,” and so we had, ironically, a 15-minute discussion and came to the conclusion that we have to trust that, whether you’re checking on your email or not, you’re at least absorbing. And the other cultural piece that I have learned from some of this research is that my training department is going to be working on something to say, on the other side of that, here is how to have an effective meeting. If everybody is sitting there checking their email, your meeting’s not effective. John: And could your meeting have been one of those emails I was checkin while you’re sitting there talking? So make sure you got your meeting planning down, make sure you got your agendas, make sure that people know what to expect, start and finish on time. All those kind of general meeting rules, and there’s another another friend of mine who talks about boring meeting stock, and his name is John Pence. Peter: Oh yes. I know John. John: There’s some good stuff around that and making sure that your meeting works. That way I can trust that they’re listening to me or they’re listening to my colleagues, not emailing and/or Amazon. Peter: As it relates to meetings, I think what I dislike the most is the conference call. Peter: It’s frustrating because, without having eye to eye contact, and then people start talking over people and then people are quiet. You don’t know if they’re there. There’s just so many dynamics… I was on a conference call with a client that was the conference call from hell because it was something like this: “so does everybody have my email that I sent out with the latest update to the spreadsheet?” What spreadsheet are we talking about? “The spreadsheet that I sent out three days ago.” What was the name of the spreadsheet? I’m not sure that I have it. And then we start the meeting and they go “no no no, I got the wrong document here,” and they literally spent 20 minutes trying to figure out what documents they need to facilitate this meeting, and by that point the meeting was really done because it was just mass confusion. John: Mm. People, around here and in other places, send out whatever we’re going to talk about next Monday are meeting. We don’t have a hard-and-fast deadline that it has to be out by Thursday. I honestly try because of my colleagues get on me. I will say this: some of my colleagues seem to be able to get away with since about eleven o’clock before our one o’clock monday meeting on Monday, but you know… it’s whatever. People will say they want to be prepared, I need to look at it, I want to look at the numbers in that spreadsheet… but then you can obviously tell exactly in that situation that some of us clearly haven’t open up that spreadsheet and looked at it. So, again, to me that’s all culture because I’ve read about different cultures. I’ve never actually seen one, I’ve been at White Castle for 25 years, but you know that if everybody is not prepared for the meeting, if you’re not prepared and get up and leave, or the senior most person in that meeting calls it and says wait a minute show up prepared. Part of our culture is we’re gonna have it sent out by Thursday for a monday meeting. Make sure you read it by monday. Peter: Right. You may not be familiar with the detail around it, but just be familiar with the documents. We can have a conversation about it, and I see a lot of that even when you’re on a board and you’ve got a lot of different personalities around the table, from a lot of different industries and stuff, and you’re having a conversation. Has everybody read the documents? And some might say well this doesn’t pertain to me and not read it, so…. they’re not able to participate. Peter: I do want to take a real quick sidestep here because you said you’re on a board of a local not-for-profit. So let’s give it a good plug. What’s the name of the group that you’re with? John: Actually, there’s three. One is, and I’m stepping down from my tenure as board chair, but I’m still on the board of A Kid Again. John: It’s an organization that does activities for children and their families with life-threatening illnesses. So any kids get to come. We take thousands of kids to King’s Island. A big thing for that is we’ve got a chapter in Cincinnati and a chapter in Cleveland, a chapter on columbus. Not only are there multiple activities throughout the year, so kids are sick and they’re going through the hospital for chemotherapy or whatever. They want something to look forward to. And the other big piece that we’ve been doing, and we’re 20 years old this last year, is that the families and siblings are involved. Because a lot of times kids with siblings, somebody’s got cancer or leukemia or something, and it’s all about getting the kids to school or to the doctor or to the hospital. The other siblings can bond around that, and we’ve got some research to show it really helps. So that’s, ironically, not the one that we had that conversation on, but… we struggle with it sometimes. But all three are different. So another one I’m on is Godman Guild, which was an old settlement house. It’s a hundred and seventeen years this year. It’s over in the near Northside. It’s moved around a little bit. And then Ohio Dominican, which is where we met. I’m on that board of trustees now. Peter: That’s right [laughs] you and Jamie. I’ve interviewed Jamie in a previous episode, but yes John and Jamie were actual MBA students of mine.. I don’t want to know how many years ago. I think Jamie said it and I’m still don’t believe it’s been over 10…. but a kid again is a great cause. Is it national, locally, or state? John: OUr home office is here. Largely, we’re actually looking at expanding. We just went through some strategic planning and are in the throes of implementing that. We’re establishing more of a national board and a local board, because everything was all run by Columbus, both chapter and advising the northern ohio and southern Ohio chapters. And we’re actively looking and and restructuring to help grow. Our vision on that one is that every every child in America has a chance to be a kid again. I know there’s a lot of sick kids out there that we can help. Peter: Now, the thing about kid again and what you do… do you work closely with the ronald mcdonald house? Peter: What a great way to get a name, and there’s a special place for people like the leader of A Kid Again because there’s a special place in heaven for somebody who can do that, be passionate about it, but also have to see the other side of it. I know that my DNA is not made of… I don’t think I could ever be that strong to look at that many tiny little caskets. So we’ll start wrapping this up because I don’t take too much of your busy time, because it is friday and if we were in Hawaii its Aloha Friday. We call it buckeye friday around here. What is the one piece of advice, as the Chief People Officer of White Castle Systems, that you would give my audience in dealing with any type of change management situation. John: I would say, from a change management standpoint, basically do all you can to listen and give people the opportunity to share. Make sure you’re listening and not coming in with your solutions, which is something I have to personally work on because I come in with a solution, sometimes, and think I don’t understand why you don’t all see… this is perfect. I even did it in some of those one-on-one meetings. Imagine this space over here, you can do this, you can do that. But I would say really listening and to what they want. The other funny thing, when I was talking to my cousin Lisa on the way home from this trip, is we’re not gonna make everybody happy. John: We desperately want people to like us, especially with that piece of our culture that’s family and we’re all part of our extended family. It’s listening, starting early… too many people give this, I would say, a short lead time. “We can start dealing with that later, once we get plans done.” Start earlier than that. Peter: Yeah, as I’m hearing the word listen, I’m obviously very sensitive to that word, it being one of the key pieces of improv, but the other piece that you say is we’re not gonna be able to please everybody. And I think, at the end of the day, as long as you go on this listening tour that you have, and this fact-finding tour, and you develop a strategy, a plan, and a culture to move forward… knowing that we’re not going to please everyone, but the one piece that we have to please is the mission, the vision, and the core competencies of the organization. And as long as we’re doing that it will all work out. I think it’s when we lose sight of that and we’re trying to please everybody, but we forget about our mission, vision, and core competencies… I think that’s when a bigger issue occurs. John: Right, and actually where I thought you you might go to is the other piece that we’ve been concentrating on around here, and it ties right in with that, and it is why? This is the reason why we’re going to not have officers, and while a lot of people have asked for them our values are around accountability and collaboration. That why, and making sure that you hit those, that’s really good. Peter: There will be challenges in those early days with this different environment that you’re creating, and that will provide different… there will be some challenges that you guys haven’t even scoped out yet… when is the expected date of completion and move in? John: Um… we’ve got another year… I think we’ve got two, given where we are and what we’re trying to do here on our location. We haven’t even really settled that we’re trying to build it here. We haven’t worked things out with the city yet. Peter: So you are way ahead of the curve in this change management process. Knowing that if it’s in completion in two years, you’re taking this time so that, when we get to that two-year period… there will be some things you won’t expect, but you may have already minimized them to maybe just a few. It sounds almost a three-year outlook. John: Yeah, because we did start in the middle of last year, so it has been close to that. We always talk about hope is not a strategy, and that’s the expectation. We do know that there’s going to be some stuff that we missed, but hopefully through our partners that we choose, places that we’ve gone in to see, and others that have shared with us their journey and have gone there before us. And again, listening to them. My mind was changed by listening to these two companies that we met with, because I was kind of thinking one direction and now, after listening to them, you know… we thought that too, but then this told us take the other option, and I’m thinking that might be the best one. Because, back to your last point, it serves the mission and the vision and the core values. Peter: And I love the fact that you guys are collaborating with others who are in the industry, and looking at best practices and learning from that in order to not go through what they’ve gone through and to try to minimize that day one change impact to create, almost, a seamless transition, even though you and I both know it’s not going to be seamless. But, to your point of take time, think it out, and start early versus when you’re throwing in late and you’re trying to shove something together… that’s just going to lead to a lot of other problems. That’s going to take a lot longer to smooth out versus getting in front of it. John: Yeah, definitely. That’s one of the things, as I said in my bio with starting out in education, which was a lot of sharing. I love the restaurant industry because you make friends and maybe move all over, but when you call up and say hey can you come down, and I know it’s not necessarily anything to do with training or HR, but we wanted to tour your building. Can you hook us up with the right person? We all open up our doors to everybody else, and that’s a fun part of our industry. Peter: Yeah that is pretty cool. It’s basically a big family industry even though we are helping out competition, per se, but it’s in a much collaborative way, and we’re all trying to compete for a lot of the same customers… but then again, some of our customers are very different. So, John, thank you so very much for taking time out to have this conversation with me. I know that my audience will take some of these nuggets of wisdom that you’ve left them and think about how they handle whatever change that they’re going through, whether it’s to build a new building, to create a new culture, to merge two companies together and all the change issues involved with that. So, once again, thank you so very much for your time. I look forward to our next conversation in the near future my friend. I’d like to thank John again for taking time out of his schedule to give us his thoughts and experiences on dealing with change. In episode 42, I interview Rik Roberts, who is a provider of clean comedy, keynotes, and laughter. Rick has a very successful podcast titled School of Laughs, and after he interviewed me an episode 80 I began my quest to start my own podcast. He is a very funny guy with a lot of wonderful insight to becoming a better presenter. Now remember, you can subscribe to my podcast on itunes, stitcher, and google play. If you’d like to purchase an autographed copy of my book Improv is no Joke: Using Improvisation to Create Positive Results in Leadership and Life, for $14.99 with free shipping, please go to my website, PeterMargaritis.com, and you’ll see the graphic on the homepage to purchase my book. Please allow 14 days for shipping. Thank you again for listening and remember to use all of the principles of improvisation in dealing with change.